Dental crowns and most dental bridges are fixed restorations which are cemented onto natural teeth or dental implants and can only be removed in-office by a dentist. A dental crown can be used to give more strength and to improve an appearance of a damaged tooth. It can cover a top of a dental implant as well. Zirconia and Emax are all-ceramic (metal-free) crowns. This type of crowns are the most natural looking and attractive and recommended for teeth that are visible during talking and smiling. Your dentist can choose shade ceramic crown which will imitate shade of your natural teeth. 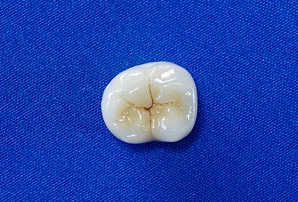 All-ceramic Zirconia dental crown is much stronger than E-max crowns and has the durability of metal-based restorations (metal-ceramic crowns), with a better cosmetic quality. All these make Zirconia Dental Crowns ideal for long-time appearance and use. Onlays, or half dental crowns, are used when there is luck of tooth strength remaining to hold a filling. A crown is fabricated in a dental lab from your unique tooth impression. Technician in our Dental Laboratory ( ADB Dental Laboratory, Floreal, Forest Lane) studiously check all aspects of your print and a crown will be fabricated from your unique tooth impression so that once the crown is placed your bite will be stabilized. A- Teeth around the space are prepared. B- Bridge trying on and adjusting. C- The bridge is cemented permanently. The bridge is an option to replace one or more missing teeth. 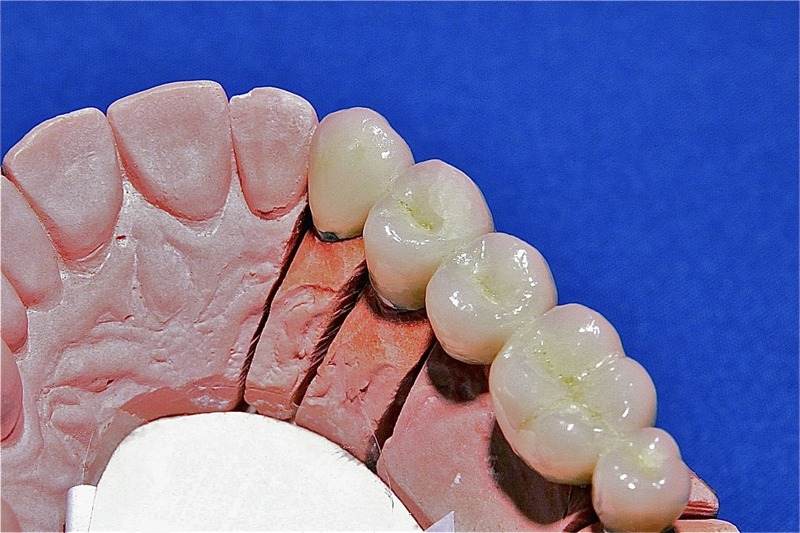 A bridge is cemented to the natural teeth (abutments) or implants surrounding the empty space. A replaced tooth (pontic), is attached to the crowns which cover the abutments. A dentist at Modern Dental Care Mauritius will help you decide which material to use for a bridge, according to its function, better appearance, and cost involved. How are a dental crown and dental bridge made? Before a fabrication of dental crown or a dental bridge, the tooth/teeth (abutments) will be reduced in size so that space will be created for the crown or bridge to be installed on the prepaid teeth properly. After the tooth/teeth preparation, a print of your jaw will be taken to provide an exact model for the crown or bridge. Using this print, our Dental Laboratory (ADB Dental Laboratory) then will make your crown or bridge, in the material you will choose. A temporary crown/bridge will be installed to cover the abutments.It will help your gums to adjust to restoration while the permanent crown /bridge is being made. The temporary crown/bridge will be removed when a permanent crown/bridge is ready, and the new temporary crown/bridge will be cemented over your prepared tooth/teeth. How long do dental crown and dental bridge last? Dental crowns and bridges can last a lifespan but sometimes they come loose or fall out. To make sure the longevity of your crown or bridge you need to maintain good oral hygiene. If the teeth or bone holding it are damaged by dental disease your bridge can come loose.Practice good oral hygiene by brushing twice a day and flossing every day. Regularly see your dentist for exams and professional teeth cleanings. Avoid chewing hard food so that it won’t damage your crown or bridge.